Enter through the carved glass doors to the first of our two lanais and breathtaking views of the mighty Pacific. From the atrium entry of PUU POA 406, the tropical decor of our newly decorated and furnished family room beckons to a larger second lanai with upscale gas grill and gorgeous sunset views from our famous Hideaways Beach to Bali Hai. Open wide the sliding glass doors of the master bedroom and sleep to the lullaby of crashing waves. From the moment you arrive, to your final swim in our heated pool, your unforgettable stay in our expansively equipped penthouse condo will be one of luxury, peacefulness and romance. 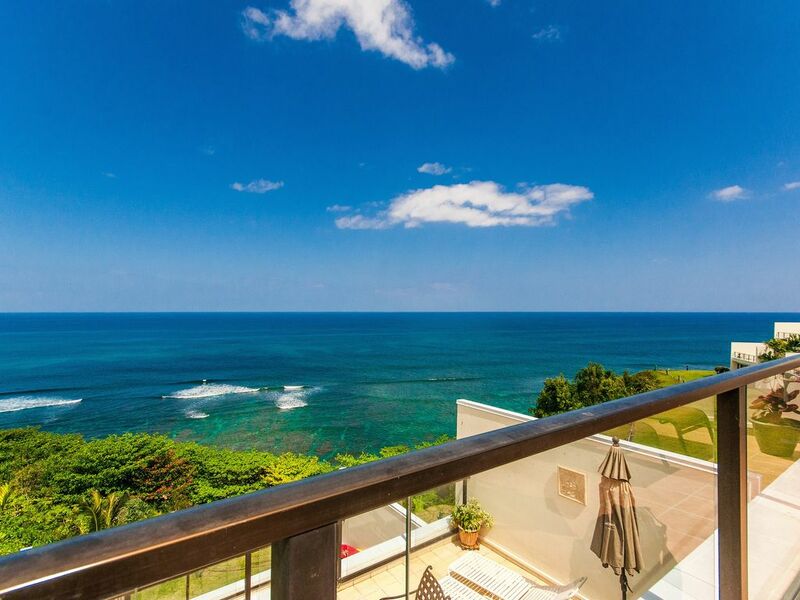 Welcome to Meli Makai - OceansSong at Pu'u Po'a - Kauai's premier condominium complex! This luxurious two bedroom, two bath penthouse unit is one-of-a-kind. The main bedroom of this spacious, 1500 square foot condominium (2200 square foot including the two large lanais), is en-suite with large bathroom, with romantic 'his and her' twin showers, and a relaxing Oriental-style soaking tub. The second bedroom, which has a great view of the mountains and waterfalls, has a queen-size bed. Both the master and the guest bedroom beds have plush, new, custom-made Island Dreams pillow-top mattresses. Located on the top floor of prestigious PU'U PO'A, this end unit has spectacular views of the reefs and surf from its two lanais (see pictures), from the main bedroom, and living room, and from the kitchen and dining room. Elegantly refurnished and redecorated, all of the appliances are new and the kitchen is completely outfitted with microwave, stove, oven, blender, etc. There is also a new washer and dryer. The large family room has cathedral ceilings, cable TV, DVD/VCR player, IPOD Docking station, CD player, and high-speed DSL Internet access for your laptop. There is a second cable TV in the main bedroom. In a quiet, end-of-the-road setting, PU'U PO'A is a solid concrete building, with magnificently maintained tropical gardens, and a pool and tennis court on the property. Because of its top-floor location and concrete construction, there is little noise from neighboring units. Our holiday home is a cliff-edge unit with magnificent close up views of whales, surfers, and sunset views of Bali Hai. The complex is right above and a short path from a secluded beach called 'Hide-Away's' which has exceptional snorkeling over shallow, bountiful reefs (see pictures). PU'U PO'A Beach is just a three minute walk from our condominium in front of the Princeville Resort. Princeville Resort has many amenities including a spa for pampering. Winter brings the whales into your panoramic views of the ocean and the high surf attracts world class surfer 'dudes' daily. Princeville is renowned for its beautiful golf courses and nearby rustic Hanalei has great dining and shopping. Relax to the sounds of the surf and enjoy a romantic sunset with panoramic views of Bali Hai from our two lanais. Hawaii Tax Number TAT# W30236070-01. Please Note: By Hawaii state law, all vacation rental reservations must be managed by a licensed on-island real estate agency. If you use the "Book It" service offered on this VRBO site we will secure your booking and then refer your reservation to our on-island real estate agency that manages our property. Had a grand condo looking north across the Pacific. Really enjoyed the shops, restaurants, bars in nearby Hanalei. Highlight was helicopter trip which allowed us to see areas now unavailable to be visited due to road & bridge construction. The property is top notch with a great location, lovely pool and spectacular views of the ocean. We love this unit and have stayed here 3 years in a row. It is well equipped with everything you need to live comfortably. We have only one suggestion to the owners for improvement. While the living room furniture looks wonderful, and is very appropriate for the location, it is extremely uncomfortable . We tried everything we could think of to alleviate our discomfort, but couldn’t find a good solution. Perhaps it’s time to consider new, comfortable furniture. Aloha David! And thanks for coming back to our condo every year. We value your comments and we certainly understand your concerns about the lounge furniture. After years of visiting Kauai and being totally in awe of its majestic beauty, when we finally found a unit in which we could spend the rest of our lives we decided to try minimize our ecological footprint. For this reason, one of the many eco-decisions we made when upgrading the unit was to buy lounge and dining room furniture made from renewable bamboo. It’s not the most comfortable choice, and not the cheapest either, but it does help us sleep a little better each night. Thanks again for your comments, and your understanding. Mahalo, Noel and Erica. The condo was outstanding. Super clean. Beds slept great. View was breath taking. Love the roar of the ocean. We would definitely come back to this place. Pua Poa 406 was top drawer, clean and views to die for watching sunsets on beautiful Hanalei Bay across from the five-star St. Regis Princeville. The unit has great furniture with beautiful tropical patterns. One suggestion is to trash the bed spreads and replace with crisp, white coverlets that sing of cleanliness. The puffy, dated spreads need to go! We were amazed to find that the owners had left us with a full tank of propane for cooking; however, we did not use it. The brand new washer and dryer were valued and appreciated. A little elbow grease and fine steel wool would clean the stains in all sinks. It was delightful to enjoy a movie each evening on Netflix. Thanks for the game and good reads. We will return. Thank you for making our stay at your beautiful condo a memorable one. We enjoyed waking up to the beautiful views while sipping coffee(thanks to the coffee maker provided) on the balcony every morning. You provided all that was needed (especially the air mattress) for a comfortable stay and will gladly consider staying there again in the future. This place is all about view and location. The good: This place is spacious, airy, and has a ton of windows that look out over the oecan. The view from the decks, the kitchen and the master is killer. We loved falling asleep to the sound of the ocean every night. The sunset view was also gorgeous. We never felt that we had to leave to find a better viewing location. Keeping the fan going and the doors open kept us cool and comfortable for the majority of our visit. Also, the location is awesome. It is just above Hideaway's Beach and we enjoyed the mellow and sparcley populated beach every day. The pool was also very refreshing. The eh: We couldn't find any beach supplies, except for towels, so I was glad that we rented everything we needed. Also, almost everything in the house needs to be freshend up. The knives were dull and much of the silverware was put back in the drawer dirty. All of the fixtures and furniture and paint are quite old, but honestly, because the view was so great, it didn't bother us that much. Something a few other people have mentioned in other reviews, is that sound really travels there. The location is very quiet and serene, so you can hear any conversation or anything going on outside (kids playing music at the pool, dinner conversations, etc). One night, our neighbors had some visitors until around midnight and even though they were inside and in an enclosed lanai, it was very loud. None of these things would prevent us from visiting again. We had a lovely time and this is a great place to come for rest and relaxation. Aloha Nicole. Thanks for your comments. I guess you didn't find all the beach supplies which are in the outside closet on the lanai, near the gas BBQ. We keep all our beach chairs, floaties, beach mats, coolers and toys there to keep (at least some of) the sand out of our condo. We have notified the management company to refresh the cutlery, (and of course to make sure its clean before new guests arrive) and to touch up the paint, which unfortunately often takes a beating from guests' luggage. Sorry it was noisy at times during your stay - house rules are to shut it down at 10:00 pm. Please let the complex manager know if it is an ongoing problem - they've called KPD on occasion when things got inconsiderate. Fantastic beaches, Golf courses ranked among the best in the nation, ocean and river kayaking, resort spa, superb restaurants. Hawaii Tax Number TAT# W30236070-01. Please Note: By Hawaii state law, all vacation rental reservations must be managed by a licensed on-island real estate agency. For this reason if you use the "Book It" service we will secure your booking and then refer the reservation to the on-island real estate agency that manages our property. They are there to be of assistance during your stay and also offer a concierge service. They will provide a rental agreement with payment and cancellation details. NOTE: Our cancellation policy is that we require that you cancel 90 days prior to your stay for a 100% refund of your deposit [which is $500] less the reservation fee. Full payment for your stay is due 90 days prior to your arrival. Please ignore the "Owners cancellation policy" statement below. It is VRBO's policy, not ours.